A collection of highly valuable statistical and computational approaches designed for developing powerful methods to analyze large-scale high-throughput data derived from studies of complex diseases. Such diseases include cancer and cardiovascular disease, and constitute the major health challenges in industrialized countries. They are characterized by the systems properties of gene networks and their interrelations, instead of individual genes, whose malfunctioning manifests in pathological phenotypes, thus making the analysis of the resulting large data sets particularly challenging. This is why novel approaches are needed to tackle this problem efficiently on a systems level. 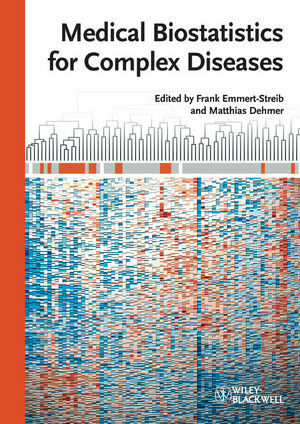 Written by computational biologists and biostatisticians, this book is an invaluable resource for a large number of researchers working on basic but also applied aspects of biomedical data analysis emphasizing the pathway level. Frank Emmert-Streib studied physics at the University of Siegen, Germany, and received his PhD in theoretical physics from the University of Bremen. He was a postdoctoral research associate in the department for Bioinformatics at the Stowers Institute for Medical Research in Kansas City, USA, and a senior fellow in the departments of Biostatistics and Genome Sciences at the University of Washington, Seattle, USA. Currently he is an assistant professor at the Queen's University Belfast at the Center for Cancer Research and Cell Biology, leading the Computational Biology and Machine Learning group. Frank Emmert-Streib's research interests are in the field of computational biology, biostatistics, network biology and machine learning, focusing on the development and application of methods to analyze high-dimensional, large-scale data from molecular biology. Matthias Dehmer studied mathematics at the University of Siegen, Germany and received his PhD in computer science from the Darmstadt University of Technology. Following this, he was a research fellow at the Vienna Bio Center, Austria, and at the Vienna University of Technology. He is currently an associate professor at UMIT - The Health and Life Sciences University in Hall in Tirol, Austria. His research interests are in bioinformatics, systems biology, complex networks, statistics and information theory. In particular, Matthias Dehmer is working on machine learning-based methods to design new data analysis methods for solving problems in computational and systems biology.